Watch out for the new Archos 101 tablet this October. 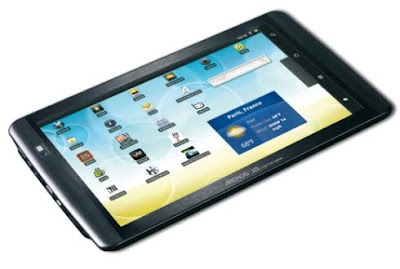 The Archos 101 will have a 10.1 inch, 1024 x 600 pixel capacitive touchscreen display. It has a 1GHz ARM Cortex A8 CPU, support for 3D OpenGL ES 2.0 graphics and 720p HD video playback. This model weighs less than a pound and measure less than half an inch thick. It has a VGA camera and an HDMI port. Other features include a 8GB to 16GB of internal storage space. It also has 802.11b/g/n WiFi and Bluetooth 2.1 connectivity. The Archos 101 tablet will be priced at $300. The ExoPC Slate Windows tablet will start shipping end of September with pre-orders for the tablet starting on September 3, 2010. The ExoPC Slate is a powerful Windows 7 computer with a multi-touch interface that allows you to browse the web, play games, watch TV and movies, listen to music, read the news, read books and magazines, organize your photos, download apps, view RSS feeds, access real-time weather, create and edit spreadsheets, author documents, and much more! Calls to the U.S. and Canada will be free for at least the rest of the year and calls to other countries will be billed at our very low rates. We worked hard to make these rates really cheap (see comparison table) with calls to the U.K., France, Germany, China, Japan--and many more countries--for as little as $0.02 per minute. Dialing a phone number works just like a normal phone. 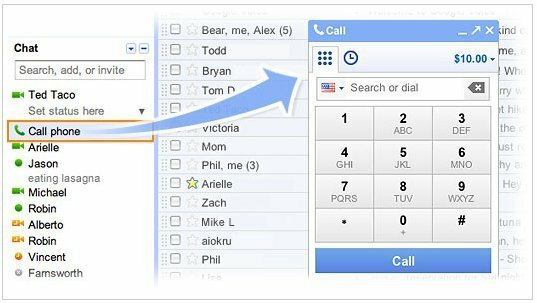 Just click "Call phone" at the top of your chat list and dial a number or enter a contact's name. Samsung will soon be launching the Galaxy Tab, their first Android tablet. Samsung put out a short video of the Samsung Galaxy Tab in action. Official launch is September 2, 2010. Now this one product I am going to introduce here is interesting and very useful for video chatting and conferencing. Have you ever been in a situation when chatting on Skype and you wished you could have a high quality video? Now it is possible to enjoy the benefits of a true HD quality Skype video calls via faceVsion FV touchcam N1. Video call between friends and family, business associates, even your clients and be surprised how the H.264 hardware encoder built in Touchcam N1 can give you the best quality video calls over Internet. The most so-called HD webcams sold in the market cannot stream true HD quality over internet, such as Microsoft Cinema and Logitech Pro 9000. Users cannot achieve HD quality internet video calls using these models. Their HD quality can only be accomplished locally. FV touchcam N1is the first Internet streaming true HD webcam for Skype video calls. Try it. FV touchcam is available through faceVision on line store, shop.facevsion.com, and other value added partners. The shop, www.shop.facevsion.com is now running a back to school promotion with $10 off any purchase, using the promo code of FVTBTS2 while checkout. The promotion ends 09/30/’10. Also check out the FV ExpressCombo. The faceVsion TouchCam N1 is the world's first Skype- certified webcam capable of delivering full screen 720p streaming video over the Internet. The TouchCam N1 features embedded hardware H.264 encoding, a chip that takes the 720p video and using high-quality encoding technology, squeezes the video into a stream small enough to be sent over a typical Internet connection. The N1 also features a best-in-class 78 degree super wide angle lens with fast auto-focus, so several people can comfortably get into the picture. The N1 attaches easily to most notebook computers or flat-panel displays and can also sit on a desktop. Easy plug- and-play installation via hi-speed USB 2.0. Are you an iPhone4 app developer? Then you should probably check getreviewapp.com. If you are doing iPhone UI design, Review is the quickest way to judge your mockups on an actual device. 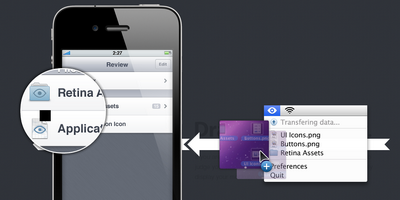 Review will accurately display your mockups on both Retina and older displays. - Review your mockups by simply dragging them to the menubar and they will sync with your device(s). - Sync your mockups directly from Photoshop with a simple keyboard shortcut. We do the rest. - Your mockups are not compressed in any way and they will look as crisp as you intended. Boost Mobile - Reboost Your Mobile! This is a Sponsored Post written by me on behalf of Boost Mobile. All opinions are 100% mine. Everyone should check out what Boost Mobile has to offer. Boost Mobile, part of the Sprint Prepaid Group, offers wireless phones and services with no long-term contracts. That is one of the best advantages of Boost Mobile, its ability to avoid contracts and its flexibility in the payment options. So why bother about silly contracts from other phone companies when there is a much better option from Boost Mobile? Boost Mobile redefines value for wireless consumers with its "Monthly Unlimited" service, offering unlimited nationwide talk, text and Web for $50 per month, and with its "Blackberry Monthly Unlimited" service, offering unlimited nationwide talk, text, Web and email for $60 per month. Redeem a 14-digit PIN from a Re-Boost Card or Receipt. 2. Pay in person. Find a re-Boost location near you. Visit the Boost Mobile website and search the zipcode. Redeem a 14-digit PIN from a Re-Boost Card or Receipt. Calling from your Boost phone? Try it! Take those low prices Boost Mobile offers, including the easy pay options and you have one fantastic mobile deal! And be glad you did! 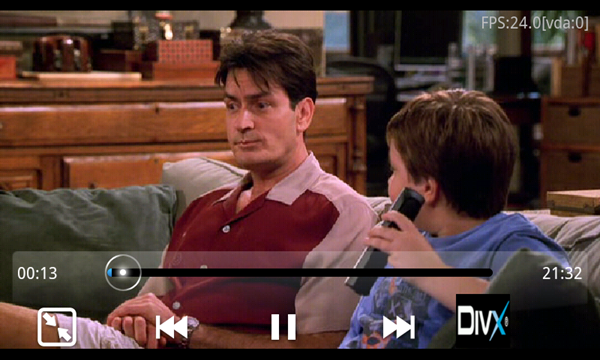 Have you tried the RockPlayer video player app for your Android phone? RockPlayer recently launched a video player that supports a wide range of formats including MKV, Xvid, WMV, and DiVX. The good thing is, RockPlayer is free for download. I already downloaded and tried it on my Droid X and plays videos perfectly. There is also a paid version, which has no advertisements. Search RockPlayer on your Android phone and download it! 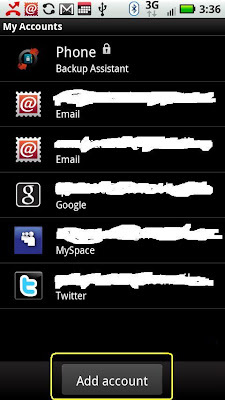 The moment I added my Gmail account on my Droid X, I constantly received notifications of new emails. At first it was cool. But it got very annoying when, in the middle of the night, the notification sound just kept on buzzing. I have a very busy inbox, and being notified every now and then may not be the best thing to do. 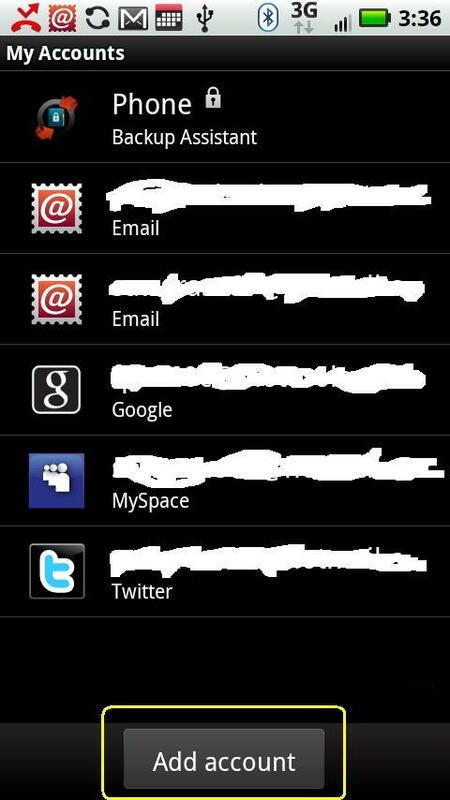 So I looked for ways to turn off email notification on my Droid X. There was really no solution in disabling the email notification without turning off the Gmail account itself. I was hoping for something like receiving the emails yet without being notified. So far, there is nothing I found online. 1. Tap the "settings" button. 2. Then scroll down and tap "accounts." Here you will find the different accounts you have set -- like Facebook, Twitter, Gmail, Yahoo...etc. 3. Select and tap the "Google" or "Gmail" account. 4. Now you are in the Data and Synchronization screen. Uncheck the "Synch Gmail", but leave the "Synch Contacts" checked. That's it. 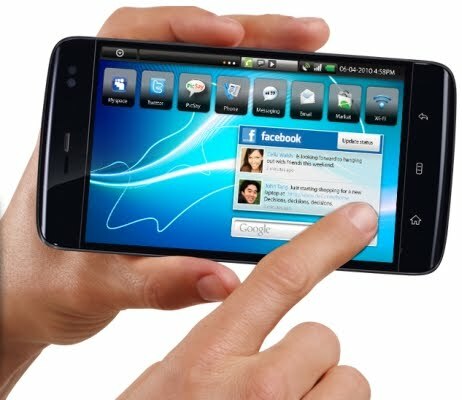 Exit the screen and your Droid X will not be getting the email notifications anymore. If you wanna check your gmails again, just follow the same steps, but this time, check the the "Synch Gmail" to activate it. Note: If any of you have other solutions, please leave it in the comment section. Thanks. HTC Google Tablet This 2010? 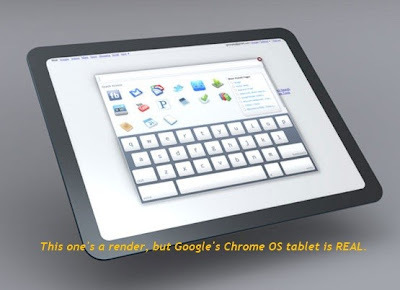 It looks like Google is really up for the tablet battle against the Apple's iPad. Rumors are getting louder about the coming of the Google Tablet, a Chrome OS tablet that will be manufactured by HTC and be launched on Verizon. Download Squad revealed that the tablet may go on sale on November 26th, 2010, in time for Black Friday 2010. So what will the Google tablet pack for hardware? While our source didn't provide any specifics, my guess is that the device could be based on NVidia's Tegra 2 platform and sport a 1280x720 multitouch display, 2GB of RAM, minimum 32GB SSD, WiFi/Bluetooth/LTE connectivity, GPS, webcam, and possibly expandable storage via a multi-card reader. 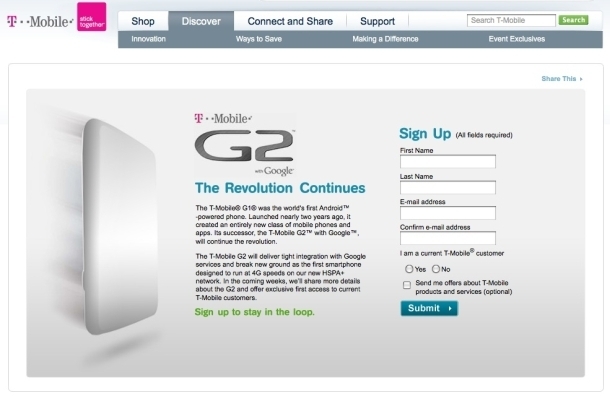 Will the TMobile G2 be better than its older version TMobile G1? 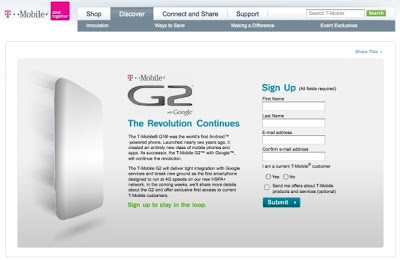 T-Mobile's new Android-based smartphone, G2, "will deliver tight integration with Google services and break new ground as the first smartphone designed to run at 4G speeds on our new HSPA+ network. In the coming weeks, we'll share more details about the G2 and offer exclusive first access to current T-Mobile customers", says PCWorld. The device is the first one T-Mobile built specifically for its new HSPA+ network, which is touted as offering 4G-like speeds on the company's 3G infrastructure. TMobile G2 (HTC) phone comes with HSDPA+ speed, able to match Sprint 4G. 2. Subtle front camera on the edge of the speaker. 4. Dedicated Lock/Unlock side switch. 1. Screen resolution 800Ã—480 or 800x600. 2. A compete design overhaul. 3. A bigger, flush screen that fills the sliding part front. 4. Ultra low-power Tegra-like processor (GPU+CPU) able to handle OpenGL ES 2.0 gfx effects, transitions, and lengthy HD playback. 5. More inward travel with keyboard key strokes. 7. 5MP camera with flash. * Java V8 implementation for faster page rendering. * Tabs instead of Windows. * Smoother scrolling/zooming, multitouch drivers. * Flash and Silverlight support. * Ability to have Googled words available on a bar to easily jump to on a page. * Full Google Earth with smooth Open GL ES 2.0 rendering support. 1. Full Bluetooth 2.1/3.0 capability out of the box. 2. App installation possible on memory card. 3. Multiple video codec support out of the box. 4. All icons are, actually, really small widgets. 5. Holding down the "Home" button zooms out to bring a "Panels" view of all the windows of the currently running programs. 7. Screen orientation changes according to the Accelerometer, regardless the status of the slide-out keyboard. 8. Pressing the "menu" button brings up an attractive semi-transparent Blackberry Storm-like menu overlay with illustrations and a 1-word description on each button. 9. Customizable camera hand gestures. Dell and AT&T will be releasing the Dell Streak 5 inch Android Tablet to the market this month. Visit the site dell.com/mobile on Thursday, August 12th and order the phone/tablet, get free second-day shipping, and snag a coupon for a $0.99 Plantronics Bluetooth headset. The Dell Streak 5 inch Android Tablet is priced at $549.99 without a contract or $299.99 if you sign up for a 2 year 3G service plan with AT&T. How would you unlock your iPhone 4 from AT&T so you could use it with other mobile network carriers? Check out this video for instructions on jailbreaking your device and installing ultrasn0w to unlock your device. Few techie folks now have the new BlackBerry Torch. 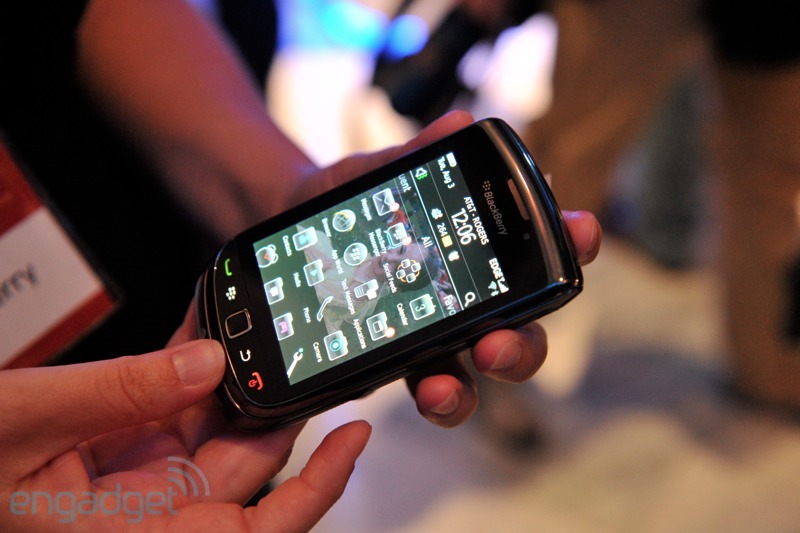 Reviews of the new smartphone are now posted online and Engadget has the video. BlackBerry Torch 9800 comes with the new BlackBerry 6 operating system. BlackBerry 6 is scheduled to be first introduced to the market with the BlackBerry Torch on August 12, but it seems the phone is out earlier than expected. Watch the video review below.